John: I think I drove. John: I think he gave up the wheel. John: I think he said it was better if I drive. John: I think just us, but I'm not sure. This hypnosis session was not the first one between Gaspar, and John, and not the first time this issue of Michael's whereabouts was raised. Suffice it to say, this is not an issue of John being momentarily forgetful. If anything, Gaspar went too far in trying to lead John into putting Michael at the Terrien's [Terriens'] and in the car, but John would still not capitulate. Indeed, the way he was answering questions about the car ride seems to be consistent with a subconscious conflict. It almost seems as though John, under the influence of hypnosis, plainly sees Michael was not in the car, and sees he was not at the Terrien's [Terriens'], but realizes someone was supposed to be there. (Frankly, Gaspar's style of questioning, in and of itself, gives that impression.) So, John is answering truthfully, but qualifying his answers out of some inexplicable concern. He says that someone, he doesn't know who, doesn't know why, but someone might have been there. 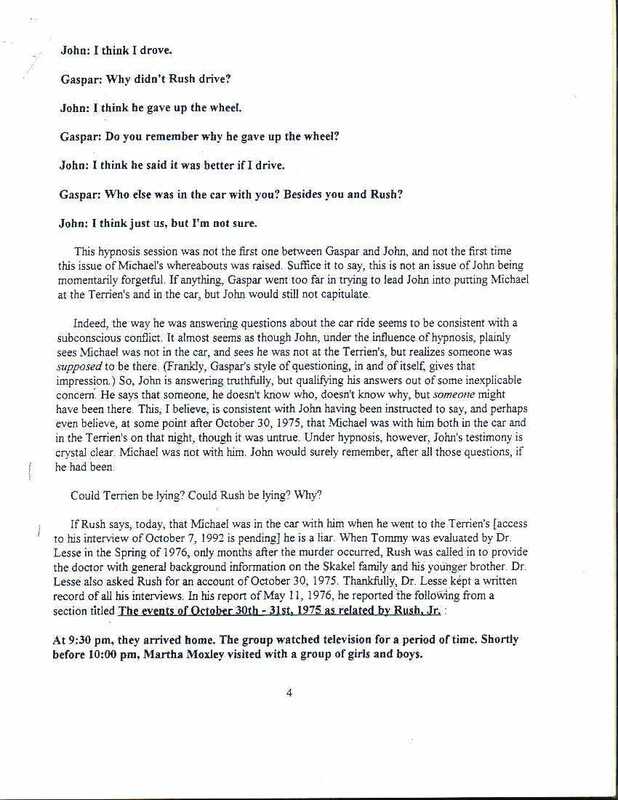 This, I believe, is consistent with John having been instructed to say, and perhaps even believe, at some point after October 30, 1975, that Michael was with him both in the car and in the Terrien's [Terriens'] on that night, though it was untrue. Under hypnosis, however, John's testimony is crystal clear. Michael was not with him. John would surely remember, after all those questions, if he had been. Could Terrien be lying? Could Rush be lying? Why? At 9:30 pm, they arrived home. The group watched television for a period of time. Shortly before 10:00 pm, Martha Moxley visited with a group of girls and boys.